What Parents Need to Know About "Flow"
You've heard and used phrases like in the zone, wired-in, or in the groove. You know it means being totally involved in what you are doing. But why is flow on a top 10 list of learning concepts for parents? After years of researching happiness and creativity, the now famous Hungarian psychologist, Mihaly Csikszentmihalyi, “discovered” flow. Csikszentmihalyi asked, “When are people most happy?” and developed the Experience Sampling Method to answer his question. He randomly paged research subjects throughout their day and asked them to record what they were doing and how they felt. Tens of thousands of respondents from all over the world were sampled. He discovered that people were most happy when they were in a mental state he named flow, the word many respondents used to described the experience. Flow is the “state in which people are so involved in an activity that they are completely absorbed and nothing else seems to matter." Flow can occur during many types of activity--from learning, to playing sports, to working on an assembly line, or even driving on a curvy road. It must have clear and immediate feedback that lets the person adjust to improve their performance. It's the second condition that is most useful to parenting and why flow makes our top ten list of learning concepts. Look over this chart. It diagrams something that you intuitively know, but makes it clearer, and more useful. 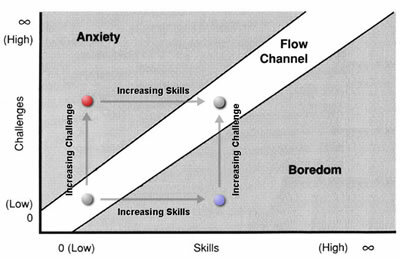 Notice that anxiety and boredom are on either side of the flow channel. If a challenge is too great for the skill level, anxiety results. If it's too easy, boredom results. That means if your child is engaged in an activity and you observe they are anxious or get bored quickly, before you get concerned about their temperament or character, ask if the task is too hard or too easy for their skill level. If it is, then their response is to be expected. Parents can get skilled at identifying when their children are experiencing flow, anxiety or boredom, and can help them to understand the principle of right level of difficulty. Kids can learn how to make adjustments to their goals so they experience more flow in their activities, whether school work, chores, or sports. Flow improves skills and provides the satisfaction of reaching goals. This next chart gives more detail about the emotional experiences associated with different pairings of challenge and skill. To achieve a state of flow requires the challenge be higher than average and the skill level be above average. To stay in flow means continuously increasing the challenge as mastery increases. If kids understand the concept of flow, when they feel unchallenged, they may develop the habit of creating more challenge, just for the fun of it. Or if they are anxious, they may learn to break down the goal into smaller units, so they can improve through more attainable steps, and have more fun. What makes flow a universal experience of happiness? The answer has to do with having 100% of attention absorbed on the task at hand. The capacity of our attention is generally limited to about 7 bits, or chunks, of information. In the course of doing a task, external distractions or internal negative thoughts can break through and use up attention making our experience feel fragmented. In a state of flow, attention is so focused there is no room for worry or distractions. Full, sustained attention just feels more gratifying than fragmented attention. Repetition is great for learning, but not so great for motivation. With flow, however, repetition becomes engaging. Consider how kids will play video games for hours on end, failing and repeating a task until they master it so they can advance to the next level. Video game designers are experts in flow design. 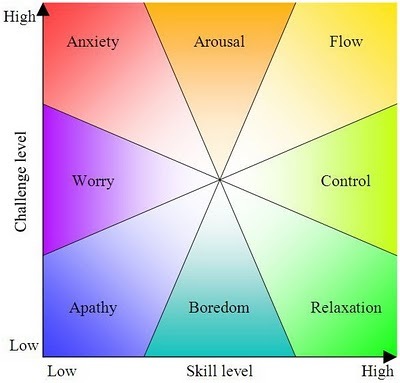 Since flow happens when the goals are clear, when challenge and skills are at an optimal match, and when feedback is immediate, it’s difficult for teachers to create the conditions for flow in classrooms with children at many different skill levels. Outside school, however, the conditions can be created more easily. Parents can learn to apply the principles of flow to add challenge, learning, and fun throughout the informal learning time they enjoy with their kids. This 5 second YouTube video tells you how to pronounce "Mihaly Csikszentmihalyi." When you can, you will be in the 99.99 percentile. How often do you get an opportunity like that? Hear Mihaly Csikszentmihalyi speak about flow in his 18 minute TED Talk. This Edutopia interview with Csikszentmihalyi discusses how to motivate people to learn and includes specific advice for parents. This article from Duke University, Help Your Child Find the Flow, has specific tips to help parents develop skills at fostering flow. Would you like to participate in a research project on happiness? There's an app at TrackYourHappiness.org for that. Get texted or emailed to report what you are doing and what you are feeling at a frequency you set, and in return get reports about your happiness levels. Flow: The Psychology of Optimal Experience, by Mihaly Csikszentmihalyi, a true classic, and foundational work in Positive Psychology. Chapter 1 of Daniel Willingham's book, Why Don't Students Like School, a PCM Top 10 Book for Parents.